Karen Pokras Toz lives outside of Philadelphia with her husband and three children. Karen’s middle grade childrens’ novels: Millicent Marie Is Not My Name and the Nate Rocks series, have won several awards including First Place for Children’s Chapter Books and the Grand Prize Overall in the 2012 Purple Dragonfly Book Awards, as well as placing first for a Global E-Book Award for Pre-Teen Literature. Karen is a member of the Society of Children’s Book Writers & Illustrators (SCBWI). Her first adult contemporary novel, invisible, will be released this summer. For more information, please visit www.karentoz.com. 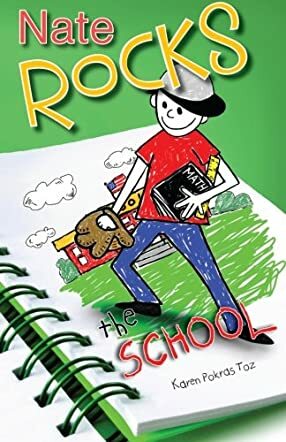 "Nate Rocks the School" by Karen Pokras Toz is the story of Nate Rockledge, otherwise known as Nate Rocks. When we first meet Nate, he is getting a parental approval form filled out by his mom for the Fifth-Grade Trip to New York City, the highlight of every fifth grade class at Nate’s school. While he is waiting for his mom to sign the form, however, Nate slips off into a daydream where a gigantic robot is menacing the city, and the mayor is pleading with Nate to save the day. Nate quickly analyzes the situation and races to the top of a building to deal with the marauding robot. As the mayor and the grateful residents congratulate Nate on his heroic act, his mom asks him why he has been drawing robots all over his permission form. Nate and his friends have been looking forward to the city trip, and they are appalled to hear that this year’s outing may have to be cancelled due to funding problems. He and his class must figure out fundraising projects that can help cover the costs of the trip. While they do so, Nate continues to solve dire problems in his daydreams. Nate is a very cool kid with an even cooler name. His daydreams provide a lot of fun. The main plot of the story, the efforts of the kids to finance their school trip, is very well-handled by Toz. The kids learn to work together, even with those they don’t necessarily get along with and, with the help of their teacher, come up with several different ways to raise the funds. I really enjoyed "Nate Rocks the School". Nate, his family and friends are brought to life and become like people I know. The teacher, Mrs. Cogin, is fabulous. Although strict and down-to-earth, she never patronizes or attempts to influence Tommy, Lisa and Nate. What starts out as a financial threat to the class trip ends up being a real learning experience for the fifth graders. Toz has a good cast of characters in this middle school series and has the ability to get readers of all ages involved in her stories. "Nate Rocks the School" is fun and well-worth your time.